It was a great pleasure to once again be invited to attend what I consider to be one of the premier and unmissable metal detecting events of the year. By this I mean the Sawbridgeworth area based series of rallies annually organised by RallyUK. 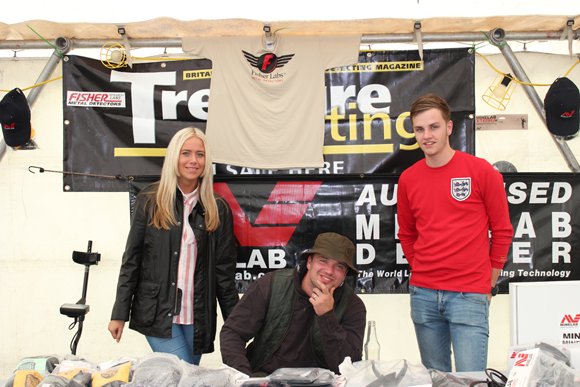 This year the venue was Tharbies Farm, with camping and facilities situated in an cooling avenue of mature Lime trees. Sadly I was not able to attend the entire event in fact it was only for a few hours that I was able to be there. However even this restricted snapshot of events allowed me to see that once again the rally was brewing up to be a most memorable event. This time I chose not to do any detecting but to have a chat and meet some fellow detectorists as well as to have a look at the trade stalls. The Dealer trade was once again represented by Dei Gratia who had a good selection of finds on display and for sale to prospective collectors. Dan from Treasure Hunting magazine was also present and also displayed a magnificent selection of his company`s published literary works. Superb publications which derive almost solely from metal detecting and then each quickly develops into a “bible of knowledge” for future generations. The long established company and retailer of metal detectors Joan Allen also had a large stand here too. Ready with batteries, headphones and sound advice should any of those unexpected emergencies arise or when a newly-purchased machine presents an operational query. I was pleased to see Mark and Luke of Joan Allen as well as having the privilege to meet other members of their team that I had as yet not met before. I would just like to add what a polite, informative and highly trained customer orientated group they are at Joan Allen`s. It is evident from the onset that they all obviously get on very well together and this is reflected in their total professionalism towards this magnificent hobby we have. Edging through the crowd I finally spotted Cliff, the stalwart principle organiser of these events, we shook hands and chatted as he steered me towards a finds display case. I didn’t expect it to be anywhere near full at this stage. But what it did contain was already breathtaking considering people had only been detecting for a few hours. I could see a few Roman Denarii, a mediaeval seal matrix, some Roman bronzes and a delightful Celtic silver unit too. Clearly some very happy people were already present at this rally as several dreams had already come true, but there was more. Part of a heraldic pendant hanger caught my attention, a large good condition Crotal bell and a well healthy selection of hammered silver was also to be seen. The good old Romans were also represented by a few of their Fibula brooches, by this stage that was most of the finds examined. 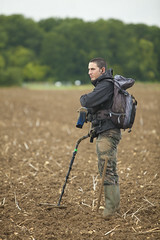 Well perhaps that`s not quite true as I have not covered the detectorists delight otherwise known as Gold!!! Yes it was here already, in all its stunning glory superbly represented by two coins. One of these was a lovely quarter Noble lying there in its just found state but somewhat crumpled condition. I must admit I like seeing hammered gold coinage looking like this, to me it has that fresh earthy appearance….and anyway let’s face it it’s not hard to straighten out gold eh? Then my eyes moved along until they settled upon it, crikey yet another amazing gold coin had been unearthed just a short-while before. I was allowed by Cliff to carefully handle both these coins. This second example was without doubt one of the most stunning coin finds I have ever seen up close. For here was a huge gold coin over two hundred years old it was an 8 Escudo`s from the reign of the Portuguese King John V. Some coin books refer to this and similar issues as the “Doubloons of Piracy”. Since the coin was dated 1748 that gave off a pretty “Piratey Feeling” to me too. Isn’t it incredible how these foreign issue coins turn up in Britain? As most detectorists are aware such issues have been allowed to circulate in Britain amongst the standard coins for over 2000 years and are good signs of trade links. In fact most examples are indeed located by metal detectorists and are thus able to be recorded be it a Roman Republican coin or a Venetian Soldino. As we all also know when you are having a great time …it flies by, it did and soon it seemed I had to head homeward bound again. Of course there will be plenty of other finds that I sadly didn’t manage to be able to have a look at. Many of these will undoubtedly be seen on various websites. As always I would like to express my admiration and best wishes to everyone who attended whether they made significant finds or not. Hopefully I will be able to meet more of you at future RallyUK events. It was simply brilliant to see so many detectorists gathered together and all united in the one aim of locating, discovering and unearthing so much of our history and clearly greatly enjoying doing so in such a lovely rural environment. See Julian photos from the Tharbies Rally on the Joan Allen Facebook page.